This primary purpose of this section of the web site is to provide local residents with a means of showing their own 'Photo Essays' depicting what we see around us every day. This will in turn provide the visitor with a taste of what they can see locally through the eyes of the people who live here. Hennock Parish Council are in the process producing a guide to local walks that will contain much more detail of some of these Photo Essays, including a map of each walk. When the Parish Council's Local Guide is available I hope to include here details of how you may obtain a copy. To view each contributors 'Photo Essay' click the picture this will open the 'Photo Essay'. Warning: Hennock is surrounded with disused mine workings and great care must be taken if straying from designated paths. This section is being developed and information will be completed as it becomes available. The Village Hall Committee organise an annual Ranger Led Blue Bell Walk following this route and ending with Tea and Cake in the Village Hall, see the Diary Dates page for the date of the next Blue Bell Walk. From the centre of Hennock by the Village Hall head west up Bell Lane to Beadon Lane. Turn right down Beadon Lane to the bridge over the stream in Beadon Bottom. 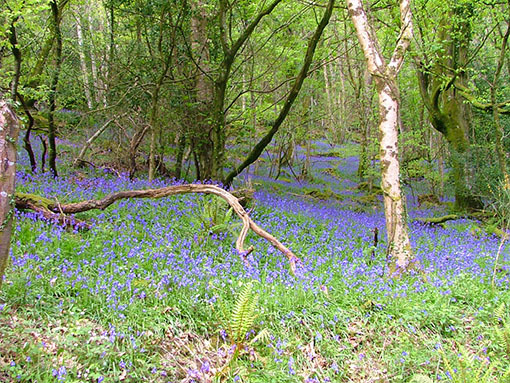 In season there will be Blue Bells throughout the valley bottom and in the woods on the left hand side. While walking down Beadon Lane there can be seen on the right hand side evidence of the old loading bays, where ore from the Great Rock Mine was loaded into carts for transport. Turn right over the bridge into the Old Great Rock Mine track. After about 500m there is a plank bridge over the stream. Cross this bridge and follow the left hand path up the hill side. If you have taken pictures of a local ramble that could form a 'Photo Essay' and you want to share it with the world, then please contact me at the address for the Editor on the In Touch Page and let's get it uploaded. All images remain the copyright of the photographer, all 'Photo Essays' published subject to prior committee approval.